The majority of AVAST customers running Windows XP said they will rely on AVAST to protect them. Last month Ondrej Vlcek, Chief Operating Officer of AVAST, shared his opinion on the end of Windows XP support by Microsoft, revealing that 23.6% of AVAST's over 200 million users were still using Windows XP. Since then less than 2% of AVAST Windows XP users have parted ways with the operating system. 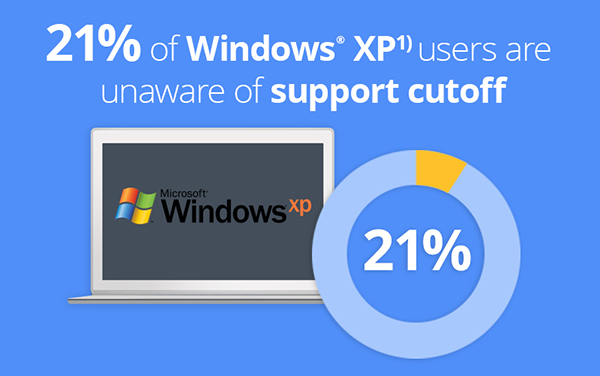 We conducted a global survey just days before the support end date to find out how aware our Windows XP users were of the support cutoff and what they were planning on doing. How aware were Windows XP users that their support was expiring? Months ago Microsoft announced that it would no longer support Windows XP, sending daily warning messages to XP users a month before the end date, April 8, 2014. The media, especially technology-focused media, has been buzzing about the end of support. 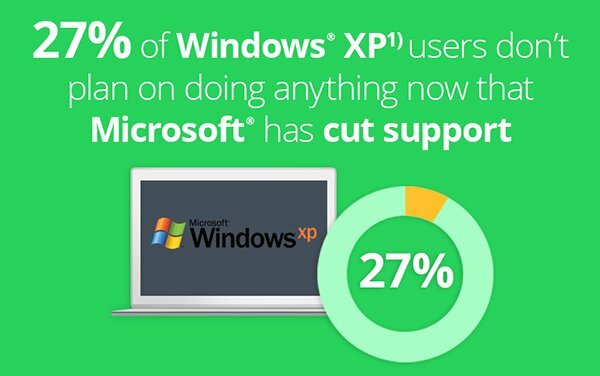 Our survey found that 21% of Windows XP users were unaware that Microsoft would be ending support, despite Microsoft’s efforts and the media attention around the topic. What actions were Windows XP users planning on taking? Although Microsoft recommends upgrading the operating system as the first option home XP users should take to protect themselves, AVAST found that only 15% of XP users were planning on upgrading their OS. The second option Microsoft suggests is for XP users to purchase a new PC, as many of the newer operating systems aren’t compatible with older devices. This does not seem like a popular option for many XP users, which is understandable considering the costs that come with purchasing a new PC. Only 5% of Windows XP users plan on purchasing a new PC. The majority of AVAST customers running Windows XP said they will rely on AVAST to protect them. How faithful Windows XP users should protect themselves. The survey also revealed that 27% of Windows XP users were not planning on doing anything. As AVAST users they are protecting themselves since we will continue to support Windows XP users for at least the next three years. This number is relatively high considering the security risks involved with the OS and makes one wonder how many XP users are not concerned about their protection and aren’t planning on upgrading their OS, buying a new PC or seeking AV that will support them. AVAST has been creating protection modules and detections specifically designed to cover Windows XP vulnerabilities and other security problems. We recommend non-AVAST Windows XP users download AVAST for the added protection. avast! 2014 is a light product, both in terms of speed and resource consumption, tailored for older PCs running XP. In addition to this, we recommend users stop using Internet Explorer, as the browser poses an even larger threat when used on Windows XP. The latest version of Internet Explorer for Windows XP is 8, which is outdated and lacks many security improvements available in later versions of the browser. We recommend XP users switch to a safer browser that updates itself, like Google Chrome.